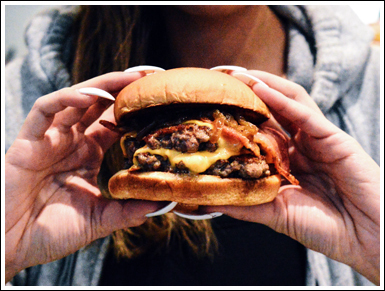 BURGERS AND BARBIE$ has come a long way since its inception six years ago: I've seen and eaten so many burgers throughout this time and people often ask me if I've grown sick of them. 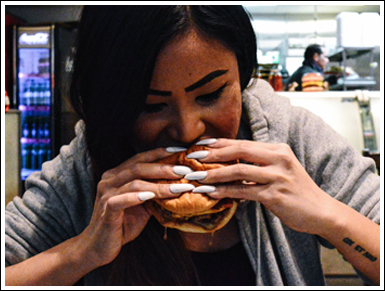 Au contraire, my friends - I've fostered such a passion for burgers that I want even more - so much, that I decided to introduce a new feature to my site called "Burger Date." 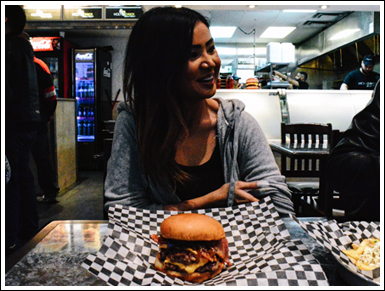 Burger Date will be the part of my blog where I interview the owner(s) and/or executive chefs of infamous burger restaurants that I have always wanted to know more about. 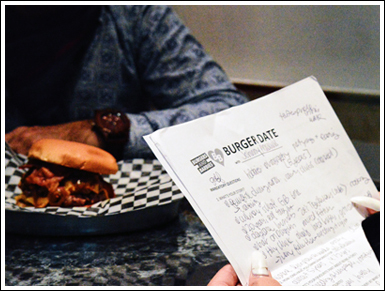 Here, I will share the back story of the restaurants and those who have come to create them - all while chowing down on their signature burgers! My first date is with none other than Johnny Prassoulis, the founder of Holy Chuck. If you couldn't already tell by my high school girl crush smile in this picture, it was truly an honour to get to interview one of the pioneers in the burger game himself. This must've been how Oprah felt when she shared the cover of O Magazine for the first time with Michelle Obama in 2009... maybe even better. A few years back, I actually visited Holy Chuck to write about the restaurant and unsurprisingly gave it a great review. 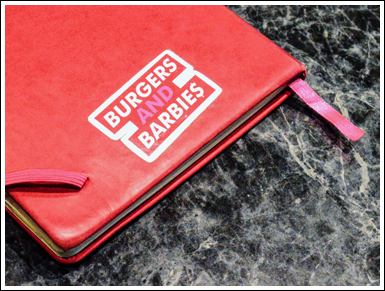 I was being interviewed by a journalism student about BURGERS AND BARBIE$ for a school project, as she observed my burger blogging routine. She was so enveloped in the interview that she didn't get the chance to enjoy a burger for herself... poor girl! After this stint, I've frequented Holy Chuck numerous time, and not once has it ever failed me. 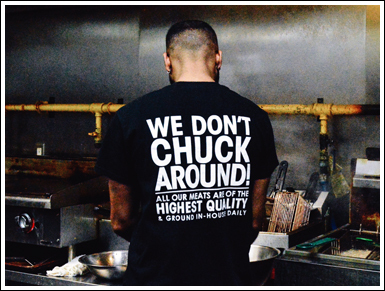 Holy Chuck has always held such a high standard when it comes to its burgers: with hand rolled patties made of aged high quality steak, ground fresh every hour - and you have Johnny Prassoulis himself to thank for that! I actually conversed with Johnny for the first time last year during the inaugural Burger Brawl, hosted at The Good Son last April. Jonny DOC was the host and emcee of the event, and at some point that evening, he went around the room and asked people what their favourite burger was. Quel surprise - Holy Chuck was the consensus. He then approached a humble, yet bashful man and once again got on the mic: "Do you know who this is?" Jonny asked the room. "This is the owner of Holy Chuck." Throughout the night, Johnny and I exchanged those I-think-I've-seen-you-before-type glances, and finally, at the end of the event, I mustered up all my courage to approach him. Like the dorky burger nerd girl that I am, I introduced myself, and let him know that I thoroughly enjoyed my visit to his restaurant, but that he may not recognize me since it was a couple years back and my hair was blonde at the time. Astonishingly enough, he actually did remember me and recalled the review I had written on BURGERS AND BARBIE$! He was kind of in a rush because he was heading to Vegas the next day, but he handed me his business card and told me to reach out to him. He suggested we collaborate on something in the near future. Although I was trying really hard to keep my cool, I don't think anything could've hid that cheesy grin on my face! A few months pass by, and as life would play out, it got crazy busy. With all the planning of Burger Pawty on my end, and lordknowswhat on Johnny's end, coordination of an initial meeting was borderline impossible. Finally had the chance to meet up sometime late last year, and we discussed some potential collaborations over burgers. I went home still not knowing how the heck I could collaborate with Johnny. 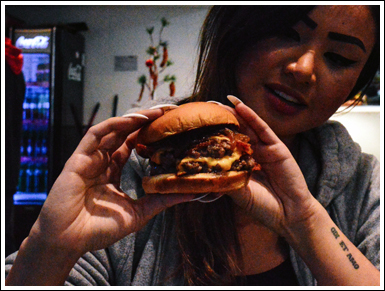 Like, how can I pry into the brain of this burger genius, but still make it fun? And then it hit me: why don't I get to know this fella a bit more, while doing something we both enjoy doing - eat burgers. And voila - Burger Date was born! So sit back, relax, grab a burger or two, and prepare to step into the mind of Johnny Prassoulis. 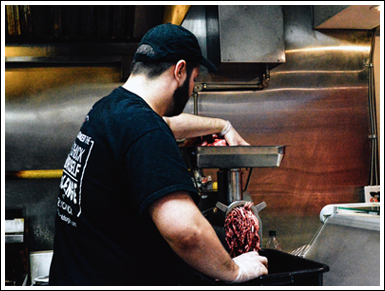 Johnny Prassoulis, as you already know, is the man behind one of the city’s top burger restaurants, Holy Chuck. 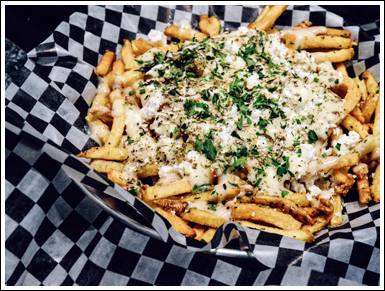 He has a short stint in culinary school at George Brown for about six months, but for the most part, what he knows gastronomically is pretty much self-taught. 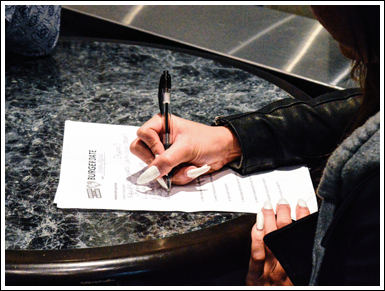 Johnny’s restaurant experience spans over eight years, having worked in a few fine dining restaurants and country clubs to start. Interestingly enough, Johnny shifted into the daycare business as the chef for Zoe’s Tender Years in Woodbridge, but as history would have it, that didn’t last too long. He eventually started working at a bar on the Danforth because he missed the kitchen. Holy Chuck opened the doors to its first restaurant on September 7, 2011. 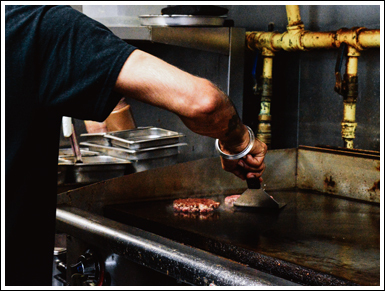 The restaurant prides itself on their hand-rolled patties made of aged high quality steak, which is ground daily – right in front of your eyes! 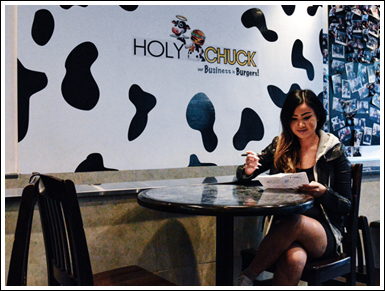 Holy Chuck doesn’t only pump out melt-in-your-mouth, juicy burgers – they are also infamous for their milkshakes, being voted Toronto’s Best Milkshake in 2014. 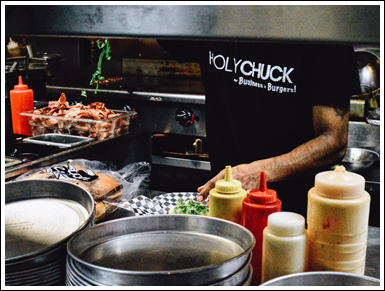 In addition to their two present locations: (one mid-town at Yonge & St Clair and the other in Woodbridge on Hwy 7), Holy Chuck plans to open a third location downtown, at Yonge & Wellesley, very soon and we can’t wait! It’s undeniable that Johnny takes pride in his work, and it shows in the quality of his craft. 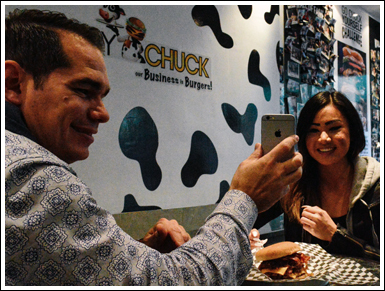 Besides cooking, this burger aficionado enjoys partying, eating, playing golf and photography, a talent that can be seen on Holy Chuck’s Instagram page. So the question is, why burgers? Well, why not?! 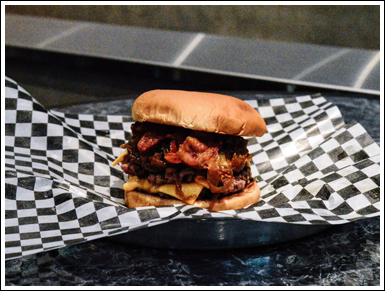 Johnny has always loved burgers, stating that it is his go-to comfort food. He decided to open up Holy Chuck because he felt that there were very few burger joints out there that were doing it right. Amen to that! HOW LONG HAS HOLY CHUCK BEEN AROUND? 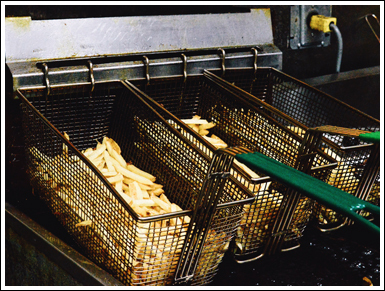 WHAT WAS YOUR FIRST JOB, EVER - AND AT WHICH AGE? I worked at my dad’s gas station in Ravenshoe at the age of 12, pumping gas and cleaning windows. The satisfaction of feeding other people. The crazy hours and the bitchy customers. WHICH CHARACTERISTICS ARE UNIQUELY "JOHNNY"? WHAT'S THE LAST PHOTO THAT YOU TOOK ON YOUR PHONE? A picture of the “Go Chuck Yourself” burger. FUN FACT: This photo was taken with Ryan from @eatfamous for their social media celebration of 100K followers! WHAT'S IN YOUR FRIDGE AT THE CURRENT MOMENT? A lot – 10 different types of cheeses, chocolate milk and foie gras to name a few. IF YOU COULD BE ANY INANIMATE OBJECT, WHICH ONE WOULD YOU CHOOSE? A camera, to capture people and moments. AT WHICH MOMENT DID YOU REALIZE THAT YOU'VE "MADE IT"? I don’t think I’ve made it – that feeling hasn’t come yet. To take my (3) kids around the world to eat. First stop: Spain. Developing my brand and making people aware of who we are and what we do. If you find something you like doing, it’s worth overdoing. Now, down to business... WOULD YOU LIKE [GREEK] FRIES WITH THAT? I knew you would! After all was said and done, I definitely worked up a well-deserved appetite. I mean, look at this beauty! Now excuse me as I indulge, please and thank you! A great big thanks to Johnny Prassoulis and his Holy Chuck family for giving me the opportunity to share this Burger Date with all of you... it truly means a lot! 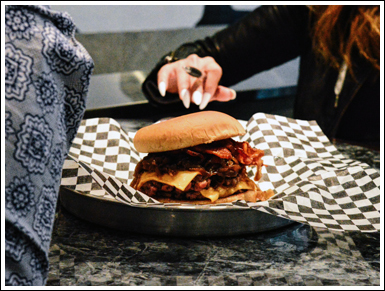 To one burger fiend to another, it was great to share our love of burgers and get a sneak peak into the mastermind behind this restaurant. p.s. Keiandra - wherever you are - I really hope you got the chance to try Holy Chuck at some point to this day. If not... hit me up... it's on me!